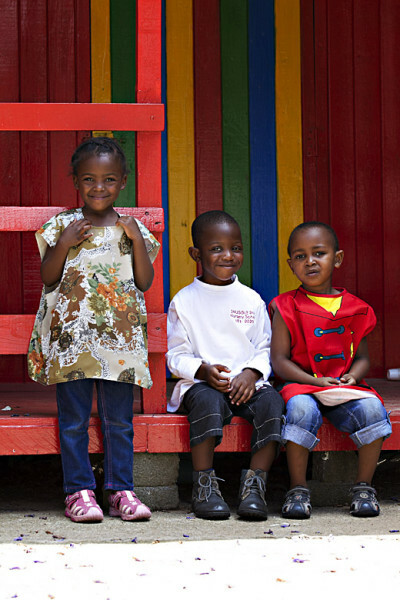 SmartStart is a new social franchise for early learning, which aims to expand access to quality early childhood development in South Africa, focused firstly on the poorest 40% of children aged 3-4 years old. The initiative will draw on the marketing and systems of commercial franchising, in order to drive demand and increase the simplicity of scale-up. However, it will be a non-profit, non-commercial franchise. A social franchise creates a mechanism for scaling up a structured programme of quality early learning (through standardised materials, training, support and monitoring), packaged as a brand which will appeal to both parents and practitioners. SmartStart will establish new playgroups across the country, as well as bringing in enthusiastic childminders into the franchise network. This will be achieved in collaboration with a range of non-profit organisations committed to early childhood development. In time, the SmartStart programme will be made available to formal early learning centres as well. The new national policy for early childhood development endorsed by Cabinet and gazetted for public comment is clear that all children must have access to quality early learning – and that will require new systems of provision to reach particularly poor children who are not in registered preschool centres. Only half of 3-4 year olds attend any out-of-home early learning programme, and the quality of many of these programmes is poor. A national social franchise provides a new mechanism for rapid scale-up, while simultaneously improving the quality of existing services. A clearly communicated brand will promote the power of parents and caregivers as the ‘first teachers’ of their own children. SmartStart is an example of the type of public-private partnership envisaged in the National Development Plan. SmartStart is supported by a group of investors which includes the DG Murray Trust, Yellowwoods and the Hollard Trust. The DG Murray Trust is one of the main funders of Ilifa labantwana, which is working with the national department and several provincial departments of Social Development to extend quality early learning opportunities to the poorest 40% of children. Yellowwoods is the holding company for Hollard, and in partnership with the Hollard Trust, has partnered with local governments in Gauteng to support a growing network of childminders to deliver quality ECD services and run sustainable ECD enterprises. Together, this group of investors has pledged R60 million over the next three years to initiate the social franchise and to forge the longer-term partnerships with the public and private sector that would enable it to achieve its national vision. How many children does SmartStart plan to reach through its programmes? Ultimately, SmartStart would like to reach the million children aged 3-4 years of age who don’t participate in out-of-home early learning programmes. With the current investment of R60 million, SmartStart will have 3000 franchisees (playgroup facilitators and childminders) operating across the country by 2018 – showing how programmes can be effective, funded and supported at scale. We estimate that a fully funded social franchise reaching 1 million children would cost about R2.5 billion a year. Put in perspective, that amounts to roughly 1% of the annual budget for basic education. Based on strong evidence of similar programmes across the world, South Africa should get at least ten times a return on its investment. At the heart of the SmartStart Early Learning Programme is ‘learning through play’. Why is this important? In the first few years of life, when the brain is developing rapidly and basic brain ‘architecture’ is formed, the foundations are laid for later development and learning. Evidence now shows that children are best supported to develop optimally when they have ample opportunities for free, child-initiated play that is supported and extended by supportive and engaged adults, and have plentiful experiences of interactive storytelling and rich use of language. The more stimulating the early environment, the more a child develops and learns. Play – the old-fashioned kind – is a lifelong skill that builds and satisfies curiosity, broadens the way we think, reduces stress, and boosts energy levels. Play allows children to create and explore a world they can master, conquering their fears, exploring, and creating meaning. The intellectual and cognitive benefits of playing have been well documented. As researchers Bodrova and Leong have shown, children who engage in quality play experiences are more likely to have well-developed memory skills, language development, and are able to regulate their behaviour, leading to enhanced school adjustment and academic learning. Play also enhances social skills – which we know is an important predictor of later academic success. Early literacy also develops in everyday activities, during social interactions and experience and when handling toys and objects. We now know that children gain significant knowledge of language, reading, and writing long before they enter school. Children learn to talk, read, and write through such social literacy experiences as adults or older children interacting with them using books and other literacy materials, including magazines, markers, and paper. When we communicate with our children, which involves both speaking and listening, we are teaching far more than words and sentences. We are letting them know that what they have to communicate and share is important, that they are important, and that we value their contribution. The SmartStart Early Learning Programme is focused on three key outcomes in particular. Firstly, that every child should have the ability to form the kinds of close relationships that make them happy and give them the confidence to shine. Secondly, that every child should be a great thinker and communicator. And thirdly, that every child should develop those core general skills – such as self-control, perseverance and flexibility – that are essential tools for living and learning. How will SmartStart early learning groups achieve this? We have looked carefully at research and experience from around the world and identified five features of successful early learning programmes – nurture, talk, play, stories and parent partnership. These are the five pillars of the SmartStart approach. SmartStart practitioners will surround children with care and attention. When young children feel safe and loved, it helps their brains to grow in the way they should. And when children are made to feel that their needs and ideas matter, their self-belief soars. Children who feel good about themselves love to try things out, are less afraid of making mistakes, work well with others and take on problems – all signs of a good learner. SmartStart practitioners will interact tirelessly with children. Words are gold. Young children need language to communicate and learn, and later on, to become successful readers and writers. And the good news is that everyday talk is one of the most effective ways of boosting early language. When adults think out loud, name things and actions, respond to and ask questions and simply chat, they are helping young children to become skilled communicators. SmartStart practitioners will create abundant opportunities for child-centered play. Play is one of the most powerful catalysts of early learning. It is also something that children do naturally and is therefore important in its own right. SmartStart practitioners will lead special story-times, full of conversation. Whether make-believe or real-life, stories are an endless source of wonder and enjoyment for children. What is more, the ways in which stories introduce new language and ideas make them a launch-pad for learning. Story-time may involve books or drama or neither, but in SmartStart groups it will always involve lots of conversation. This kind of interactive storytelling is particularly valuable because it encourages important thinking and language skills. SmartStart practitioners will build strong partnerships with parents and caregivers. Parents are children’s first and most important teachers. SmartStart groups will therefore support parents to make their home a place of rich learning opportunities. Valuing parents’ capability and ingenuity, SmartStart practitioners will encourage parents to recognise and appreciate what they already know. At the same time, information-sharing and workshops will motivate parents to reflect on what they do and to strengthen and build their ability to support their children’s early learning experiences. To find out more about SmartStart and how you can get involved, visit our website – www.smartstart.org.za – or contact Carol-Ann Foulis or Justine Jowell at hello@smartstart.org.za. Comment:I like the business idea. Send me more info. How can I be involved? Our church is registered as a NPO. Hi Jacobus, we would love to get as many people and organisations as possible involved in early childhood development. Where is your church based? (Have a look at http://www.smartstart.org.za for more information on SmartStart). I’d very much love to be part of your projects . 1. About day mothers; do they get paid by smart start? 2. Do they charge school fees(day mothers)? 3. As day mother am I allowed to look for funding from other companies? Hi Refiloe – thanks for your interest in SmartStart. The day mothers don’t get paid by SmartStart – instead they are able to earn income from parent fees. Once a day mother programme is established and registered, it may also be able to access funding from government. SmartStart day mothers are encouraged to seek local support from companies and other businesses so long as their are no conditions that conflict with the SmartStart programme. Hi, I would like to be involved also we running an npo. We are based in orange farm please give me the details on how to contact u.
Hi Eunice, why don’t you write to them directly at: hello@smartstart.org.za All the best for your centre, sounds great! Smart start is a good programme and it will make a great deal of impact, change and difference on the lives of the beneficiaries. But one thing I don’t understand is the fact that day mothers are not going to be paid by the programme having R60 million budget. The the investors DG Murray Trust, Hollard and Yellowwoods must come to the party and make funds available to provide an incentive to the day mothers. Currently South Africa is faced with more than 23% unemployment rate and the majority of people are struggling to make ends meet. Most us dependent on social grants which are already stretched to the limit. Some of those kids who are targeted by Smart start are already victims because parents don’t afford preschool fees. Then how is it going to be possible for those parents. to pay for the kids. Please do consider this it is serious if you need Smartstart to be a success. Preschools themselves are struggling to make ends meet because they are 100% dependent on Social Development subsidy which is not consistent even. Smart learning are interested to be an franchiser. Must we be a npo?